We have quite a few articles discussing bit and symbol error rates for popular digital modulation schemes in Additive White Gaussian Noise (AWGN) channel. 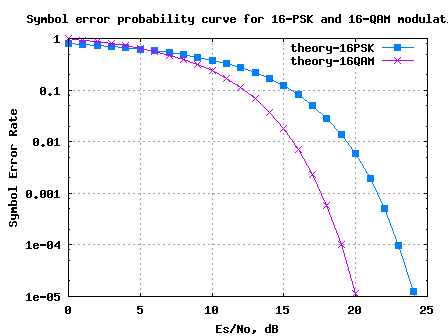 This post summarizes the articles discussing the theoretical and simulated error rates for the digital modulation schemes like BPSK, QPSK, 4-PAM, 16PSK and 16QAM. Further, Bit Error Rate with Gray coded mapping, bit error rate for BPSK over OFDM are also discussed. The links to the individual articles and the Matlab/Octave simulation models are listed below. Alternatively, I have made a e-book discussing all the below mentioned articles to a single PDF file. If you wish, you can download the free e-book by subscribing to the free email newsletter. Existing subscribers can contact me to access the e-book. The links to articles discussing and the Matlab/Octave simulation models are listed below. 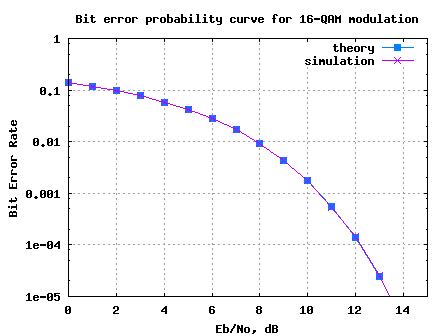 Click here for Matlab simulation for bit error rate (BER) curve with BPSK modulation. Could you please send me the ebook via email? Please, can I have the ebook on my mail box ? I did subscribed the e-book, but have seen nothing how to download it. Could you please give me some help? Looks like I’m having the same problem downloading the e-book as the other subscribers. Can you e-mail me the instructions too? Hello, I also subscribed, and like the other, was unable to download the ebook. Can you please send me the instructions? I have subscribed and also replied to the mail but can’t figure out how to download this book? I would like to download the free e-Book on error rate in AWGN. Could you please send me the instruction? Thanks alot!!! I subscribed..Can I get the link to the ebook ?? how to get the ebook.? I would like to download the e-book but I don’t now how to get link. Thanks in advance. please send me this ebook! i think, i need all of the book… because many question… if i haven’t read all of the book… please send me too… thank you…. I need the ebook,thank you. I have registered and subscribed to the block. Please let me have the link to the free ebook. Please help me to understand my results. I have simulated in Simulink (Bernoulli, Hamming Encoder, BPSK Modulator, AWGN, BPSK Demodulator, Hamming Decoder) BPSK with AWGN and have obtained that Hamming (7,4) code has lower BER than Hamming (31,26). Is it connected with noncoherent demodulation? I have subscribed but do not know how to get your book. Please send me the book. I subscribed but i dont know how to get the ebook ? Could you please send me ? How do I get a copy of the ebook, since I am already a member ? I would appreciate if you send me an ebook about simulation of modulation. Please send me the ebook, thanks! Ur work is helping me a lot in my research. I would like to have the ebook to getting more out of it. Can u pls send me the link. Hi, can you send me the download instructions? @Alex: emailed you the instructions. I have subscribed to this blog but i didn’t get the e book. I’ve registered and subscribed to the blog, can I have the instructions on how to get the ebook? Can you send me link to download ebook? I have registered at the site a few days back. please send me the link for downloading the book. hi, can you please tell me what are the changes to be made in the symbol error probability code for QPSK if I want the bit error rate instead? I have subscribed but i didn’t get e book. Please send me the instructions to download the ebook. I have subscribed but i didn’t get e book. Can you send me the book? I have subscribed but I can’t see any e-book. Could you send me instructions ?? Thank you. I have subscribed but when I replied to get a free ebook it was failed to send email to your address. Could you please send me ebook by email please. Thank you so much. Hi Krishna, I subscribed the feed, but it is a no-reply address, would you please send me a copy? @usman: Have you subscribed to email newsletter from dsplog.com. If not, please click here to subscribe. email and you will receive email instructions on how to download the eBook. I have already finished my subscription. Could you please send me the URL of the book. Thank you very much! I have subscribed. Please email me the download instructions. I am unable to reply to the confirmation mail. im student of final year telecommunication..
i am already a member, could you please send me the ebook? I subscribed but cannot reply to the email. Can you please me the book. Please, help me to download your ebook. Have you subscribed to email newsletter from dsplog.com. @Rohit: Have you subscribed to email newsletter from dsplog.com. I want this ebook , please send me the download URL. may I have the link for AWGN eBook? thanks in advance! well sir i must say u hv a very big heart ……….. Sorry, Krishna. I subscribed, but nothing happened! Can you send me the URL. @manaroff: Thanks for the comment. Have you subscribed to email newsletter from dsplog.com. Would you please send me the ebook? Thanks in advance. @Abu: Thanks for the comment. Have you subscribed to email newsletter from dsplog.com. I’m already member of dsplog and i’m interested with your website and the free e-book. Would you kindly please send me the free e-book? Thanks in advance,Khrisna. Hi Krishna, would you share the ebook please…thanks a lot. Would you please send me the download URL, thanks a lot! @Daniel: I emailed you the instructions. Can you please send me the copy of the ebook ! I am doing my report on OFDM and I would like to thank you for your work! @sal: I emailed you the instructions. Please I want the e-book. I am a student from China. Your work helps me a lot. Please send me a copy of the book. Thanks. @Peng Li: I emailed you the instructions. May I get a copy of the ebook? @uma: I emailed you the instructions. can u please send me a copy of the pdf file, I really very neeeeed that! and THANK YOU for the cool work! BTW this site is really really what i need !!! @sndi: I emailed you the instructions. @lakshmi narayana: Sorry, I have not discussed CDMA scenarios in the blog. However, I would guess it will be reasonably simple to adapt the QPSK mod/demod post to the CDMA case. At the transmitter, multiply each symbol by the PN chips. Correspondingly, at the receiver convolve with the PN chip and pick the maxima. and Ihave paper (journal ) but I dont know simulate it, pleaze help me to send me the code to summerize it. I am not sure whether FSK results will be 3dB poorer that the BPSK case, but I would guess so. Sorry, I do not have simulation for the mentioned paper. @Nana: I emailed you the download instructions. Hello please tell me how can i get the e book. ur blog is very informative. good work..!! @swamy jsv: I emailed you the details. I’ve learned a lot from your articals,thanks for your work! Please send me the download instructions. how do i download the ebook? I would really appreciate if you could send me the ebook. @Preppy: Have you subscribed to email newsletter from dsplog.com. @Amjad: Sorry, I need more study to reply to your queries. And due to time constraints, am unable to allocate time. Kindly excuse. @ZhangRui: I emailed you the download instructions. @fariha: I emailed you the download instructions. Request you for the Ebook. @Ishwinder: I emailed you the download instructions. But I don’t know how to download. If you O.K. can you send to me e-book? @Choe: I mailed you the download instructions. Please check. thank you for sharing such information.it is helpful in acquiring the knowledge about programminig in MATLAB. can u help me in the topic use of wavelet transform in OFDM . i m doing a project on it. @vijay: I emailed you the details. @girish: I emailed you the download instructions. @Anis: I emailed you the instructions to download the eBook. we are doing a project to implement adaptive channel equalizer using MAT LAB. can you provide us coding of adaptive channel equalizer. @ahishek: I have not yet posted articles on adaptive equalizer. good luck. I have subscribed for the e-book, but i haven’t received any. Can you tell me the procedure to download it? I need equations on QPSK so that i can calculate bit error and eye diagram using matlab. Can u help me? Your blog helps me to learn OFDM , thank you very much for that. Could you send me the download instructions ? Could you send me the link? @Pit: I emailed you the instructions. Plz check. @Alhad: I emailed you the download instructions. Plz check. @smoodliar: I emailed you the download instructions. Plz check. @vanitha: Sorry, the two days have long passed Hope you found the required information. Could you give a copy of free ebook ? You really set up a good website of communication system. @Raymond: I emailed you the download instructions. Please check. Channel State Information Enhanced Adaptive MC CDMA. @Tahir Abbas: Good luck for your thesis. i want to plot different modulation schemes BER vs Es/No in awgn channel on a single plot.for example, 0 to 9 db QPSK modulation, 10 to 11 db 16 QAM modulatio,12 to 19 db 32PSK modulation and so on. its output will be a single line at series of Es/No values.can u help me about this? @farrakh: From your question, it sound like you want to build an adaptive modulation simulation. Though I do not have posts discussing this explicitly, hope you will be able to adapt the QPSK, 16QAM and 16PSK simulations to meet your need. Hi Krishna, I am working with mobile location in IS-95 CDMA system. Could you please send me matlab simulation m-file for QPSK modulation and demodulation of Pilot signal in IS-95 CDMA for Pilot channel acquisition. It would be a great help in my research. @Kabir: Sorry Kabir. I have not tried modeling IS-95 systems. @Girish: How do you achieve different code rate – by puncturing the convolutional code? I need to build a code of probability of Bit Error rate of BPSK, 16 QAM and 256 QAM and QPSK. I need some help. where could I get help . Can you Please help me on that regards. @taher: Sorry, I have not tried modeling co-operative communications. I am also worikng on multi-hop relay network. I am new in this area and need some help from you. if you can give me ur email address please. i’ll wait for ur reply,plz contzct me on my email. Please send me your e-book on AWGN. @John: I just mailed you the download instructions over email. Plz check. @Girish: I just mailed you the download instructions over email. Plz check. Hi, I’d like a copy of the e-book as well. @Matt: I just mailed you the download instructions over email. Plz check. @Carlos: I just mailed you the download instructions over email. Plz check. I am a member; can you please send me the URL for the ebooks you have? Thanks a lot. @Muhammad: I mailed you the download instructions. Plz check. I need errors in computing like inherent errors,absolute, relative, modeling errors…..
am yet to get the ebook. @val: I just mailed you the download instructions. Please check. plz mail me link to download book…..
@mukul: Have you subscribed to email newsletter from dsplog.com. Please send me this e-book! @hugh: I just mailed you the download instructions. Kindly check. @Bijukumar: I mailed you the download instructions. I admire your dedication and sincerity in helping others by giving useful suggestions, ample guidance and valuable advises. I am doing research in communication field and topic is to improve the performance of ofdm systems. my plan is to minimise PAPR and Frequency offset by using scrambling(PAPR Redn) in Txr and Windowing in Rxr(ICI Cancellation), plz comment on this and if you have any suggestion it will defenitely help me. @Bijunair: Well, even I have not done much on PAPR reduction rather than using scrambling at the transmitter. Am curious about how you are going to reduce the effect of frequency offset by using windowing in receiver. You may point me to some references which you are using. Thanks. @radman: I just mailed you the download instructions. @kanchana: If you had subscribed, you should have got the email download instructions. Maybe the email got incorrectly flagged as spam. Anyhow, I just mailed you with a fresh set of intructions. Please send some information about Space time block codes.i.e introduction with two pages for the documentation. Hi, Krishna , i have subscribed the newslater, please send me the download link! Thanks! Expecting your reply! @Danial: I just mailed you the instructions. Please check. Sorry, I didn’t received your e-mail yet. Would you please resend the e-mail to me? @Murali: I mailed you the download instructions. Please check. You are really doing a great job! @val: I send you the download instructions over email. Please check. Please send me the link for the ebook, thanks a lot. @Munish: I had mailed you the download instructions over email. Please check. Please send me the link for the ebook, thanks! @coss: I had mailed you the download instructions. Please check. @mansi: I had mailed you the download instructions over email. Please check. @Arif: I mailed you the link. Would like a copy of e-book onerror prob. @A-Imam: I mailed you the download link. Hi, could you please send me the copy of the ebook Fundamentals of communication systems by John G. Proakis and Masoud Salehi. I’m studying communication systems and looking for some reference sources. Thanks a lot. Signal Processing for Communications – http://www.sp4comm.org/webversion.html. Nice read. @ communications engineer : Typically, the e-Book is offered for subscribers who have opted in to receive posts over email. Anyhow, since you have already joined Google FriendConnect, I have send you the link over email. @Fred: Is this a question or a statement? vectors. The detector finds the closest signal point to r.
theoretical estimates (curves) and the simulated error rates (points) in one figure. @Hyde: I emailed you the download URI. would u mind to send me the download URL,, thanks alot..
@Shreyas: I had sent you the download URI over email. @Steven: I mailed you the download URL. Happy learning. @Ramu: I just send you instructions over email. I would really appreciate if you could send me the ebook too. @John: I just mailed you the download instructions. Plz check. @jamal: I have sent you the download URL over email. @ShanmukhaPriya: Sorry, I do not have time to simulate that work. Good luck. I would also like to download this book but I don’t now how to get link. Thanks in advance.